BETHLEHEM (Ma’an) -- A 17-year-old Palestinian died last week after Israeli authorities refused to allow him to leave the besieged Gaza Strip to undergo treatment for a congenital heart defect, the Gaza-based al-Mezan Center for Human Rights said in a report on Sunday. Israeli authorities had denied Ahmad Hassan Shubeir from Gaza City, permission to cross into Israel to receive life-saving medical treatment from a hospital after the teen “refused to serve as a collaborator for the Israeli authorities, a coercive measure regularly employed on Palestinian patients in need of permits,” according to the center. After being repeatedly denied permission by Israel to cross, despite securing a number of appointments at Israeli hospitals as his health declined, Ahmad died at approximately 4 a.m. on Jan. 14. Ahmad’s father told al-Mezan that his son had been suffering from a congenital heart defect since birth. The father said that he accompanied Ahmad several times to Israeli hospitals, including Tel Hashomer Hospital, Schneider Children’s Medical Center, as well as al-Makassed Hospital in the occupied West Bank, and that Ahmad’s condition remained relatively stable throughout the treatment. After Ahmad fell into a critical condition, his family applied for a crossing permit in February 2016 with supporting medical documents attached. According to the report, Israeli authorities responded to the request by attempted to blackmail and coerce Ahmad’s mother into cooperating with the authorities in exchange for her child’s permit during an interview at the Erez crossing. Though she refused, authorities ultimately allowed her and Ahmad to pass after being held several hours. A subsequent permit request in September received no reply from authorities, and after the family obtained a new hospital appointment, the applied again in October, again without reply. In November, Israeli authorities replied to another permit application with a refusal. “The Israeli security services then summoned Ahmad for an interview at the crossing; during the interrogation, he was pressured to serve as a collaborator for the Israeli authorities in exchange for his permit. The child refused and was denied a permit,” al-Mezan’s report continued. Finally, the family again obtained an appointment at a hospital for Jan. 30, 2017, as Ahmad’s health continued to decline. He died two weeks before the appointment. “Al-Mezan strongly condemns Israel’s ill-treatment of Palestinian patients of Gaza and expresses remorse at the death of Ahmad Shubeir,” they wrote in their report. The group warned of the continued “abuse” of critically ill Palestinian patients sealed inside the enclave, where health care services are crippled due to Israel’s ongoing blockade of the small territory that will enter its tenth year this coming June. “The denial of adequate medical care, which amounts to ill-treatment, is in violation of treaty and customary international law, and amounts to a prohibited collective punishment,” al-Mezan stressed, noting that the Israeli hospitals Palestinians are attempting to reach are in close proximity to Gaza. According to the center, 2016 represented a steep decrease in the number of permits granted to Palestinian patients wishing to pass through the Erez crossing: In 2015, 77.66 percent of patients were granted access, whereas 61 percent were granted in 2016. Israeli authorities have also expanded the age group of those subjected to increased security checks from 16 to 35 years old to 16 to 55 years old, "which subsequently expanded waiting times and resulted in increased rejection of permits." Between 50 and 60 percent of the patients who were refused permits in 2016 by Israeli authorities were people with cancer, with al-Mezan noting a trend that developed over the year, "whereby cancer patients were granted up to three permits, but not more, resulting in unfinished cancer treatment, and greatly diminished effectiveness of cancer care." Furthermore, Palestinians who were finally granted permits were nevertheless subjected to measures that al-Mezan said amounted to “cruel, inhuman, and degrading treatment,” including long-waiting periods, intense interrogations, invasive searches, blackmail, and coercion, all of which that were greatly strenuous for the sick patients who were not given sufficient rest amid the procedures. 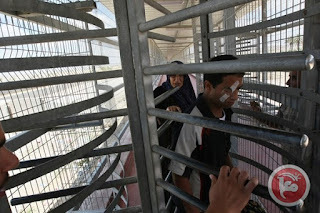 The center further noted that obtaining a permit did not even guarantee a successful crossing for Gazans, reporting that Israeli forces arrested at least nine patients in addition to five Palestinians accompanying patients at the Erez crossing in 2015 and 2016. Despite the appalling cruelty and extreme racism of the Zionist enterprise, there is room for optimism here. Pressure or no pressure, the Palestinian people lives!